Mario Forever Revolution is a whole new Mario Forever game that will include a bunch of new stuff in the Mario Foever scene. This game won’t include just the main game with some extras, but it will include many different modes, from a “Story Mode” to a “Mission Mode”, other than updated graphics and codes. 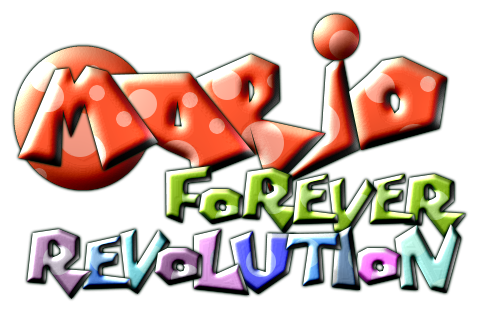 One of the main new features of MFRevolution is the new roster of characters; you won’t play only with Mario or Luigi, but with 8 more characters never before seen or playable in the Mario Forever history, like Princess Peach, Toad and Yoshi. New enemies won’t miss! Other than classic Goombas, Koopas and Bowser as a boss, there’ll be specific enemy-themed levels, like Pokeys for desert levels and Swoopers for Underground ones, and also new bosses like Bowser Jr. and Boom Boom in fortresses, and more! Development of this game started in very late 2015, when I thought that building a different Mario Forever game was something I necessarily had to do. I started to mess more with codes, to study the engine deeper, and to play with elements here and there. Finally, less than a year later, I finished level template for demo release purposes, although whole engine wasn’t finished yet. In 2017, for celebrating my 20th birthday, I’ve released the first version of the game; v0.001 demo beta. As for now, development is on heavy hiatus, but I hope that I’ll bring it back again, once I’m done with some more general stuff. This site is NOT affiliated in any way with Nintendo. Mario and all relatives belong to Nintendo. Every other element and its relatives belong to their original authors.